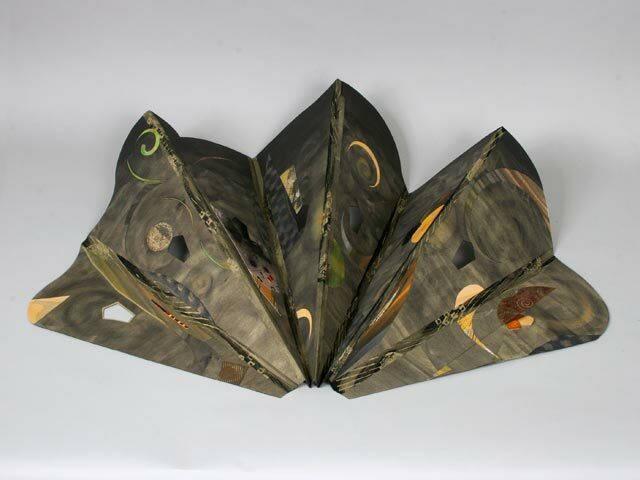 My artist’s books and related wall pieces are made with hand-printed and painted papers, inkjet prints, found objects, and art materials; I use various established and ad hoc techniques. Whether the book is a mobile, a stack of shapes or a traditional codex, the ideas unfold over time and through space. These works stretch the limits of the book form. In each, a sequential form expresses the concept and a wide range of materials gives depth to the imagery. All aspects of the book- form, content, materials, binding, and housing- serve the concept motivating the work. Much of the imagery in my work is of ordinary objects; the concepts distill everyday conflicts with expectations, constraints, chance, and uncontrollable situations. Objects and images assume metaphorical significance; they become symbolic of events, associations, and the attached emotions. 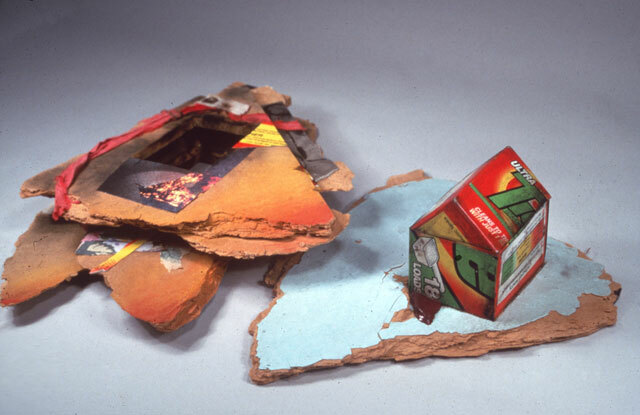 Materials, concept, and process interact to produce conceptually provocative and aesthetically evocative work. 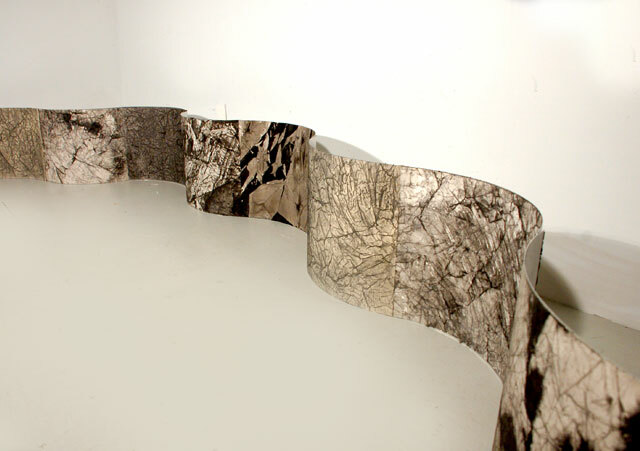 Drawings, inked, crumpled, rubbed, and pressed, were mounted on aluminum sheets which were then rolled; the five convex and six concave sheets curve to a depth of 4”and can be assembled end to end to form a wave of paper, either in a long line, a semicircle, or in segments. The wave stands alone or serves as a backdrop for the artist book Press/Crush described below. 12 double pages: cover, 10 pages with objects, last page with text. Aluminum objects flattened with a steamroller fossilize violent actions. These objects combine with drawings, rubbings, prints, and collages to further the theme of crushing pressure. 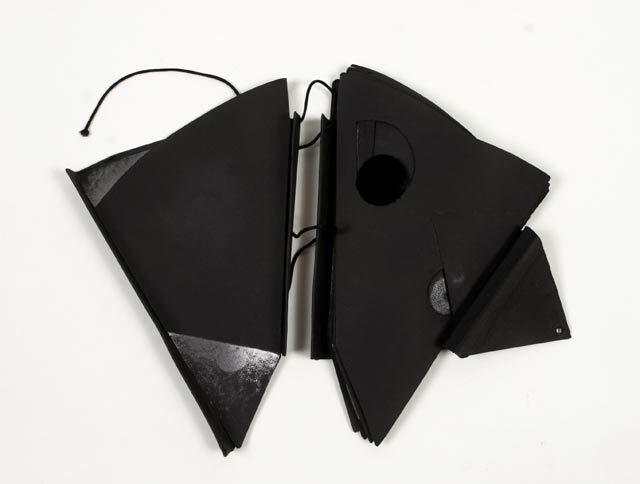 The double pages fold open to support the structure; the crushed objects hang suspended. The text on the last page riffs on the word press: repress, depress, oppress, compress, decompress, expression, impression, impressive, pressure. Dual works, Mirrors, an artist book, and the video mirrorrim use photographs of rooms through mirrors and collages from superimposed images to explore visual interiors and absence. The text, "If you can’t see my mirrors, I can’t see you," is from a snapshot of a passing truck. Bits of mirror reflect the text and collage elements enhance the images. 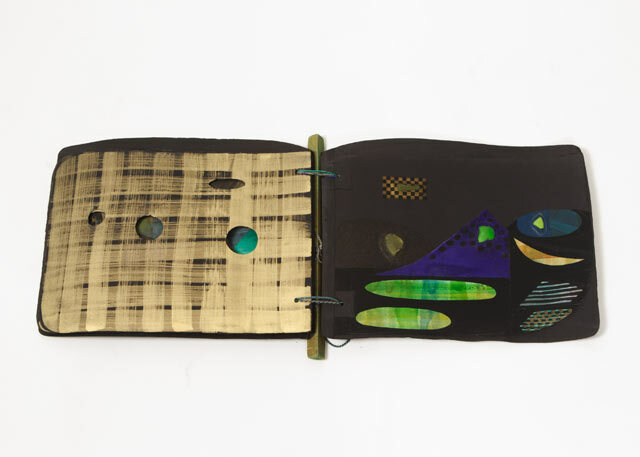 The book is bound with delicate metallic fabric and is meant to be displayed open and can be hung on the wall. The curved pages fold and fit into a cookie tin; the top reflects the title of the book so the reverse writing can be read. 7 1/4"x 10 ¾" x 2"
Four matchboxes hold lists of the US soldiers who have died in Iraq between March 2003 and March 2007, the fourth anniversary of the war. Their names are mounted on burnt matches; each match holds about fifteen names and resembles a flag. 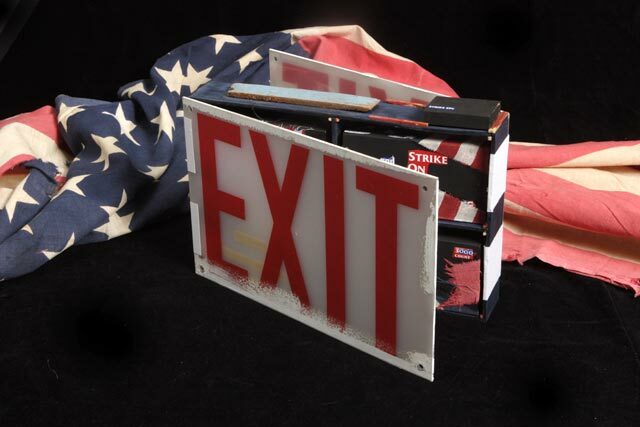 The four boxes fit in a case made from two exit signs. 10" x 12 1/2" x 2"
In the first spread, Removal/Remove, magnetized plaques detach to reveal images of things to be removed. In the second spread, Remove/Move, a magnetized disk lifts and attaches to a spinning mechanism. The third spread, Immovable, features an embedded fossilized crab. 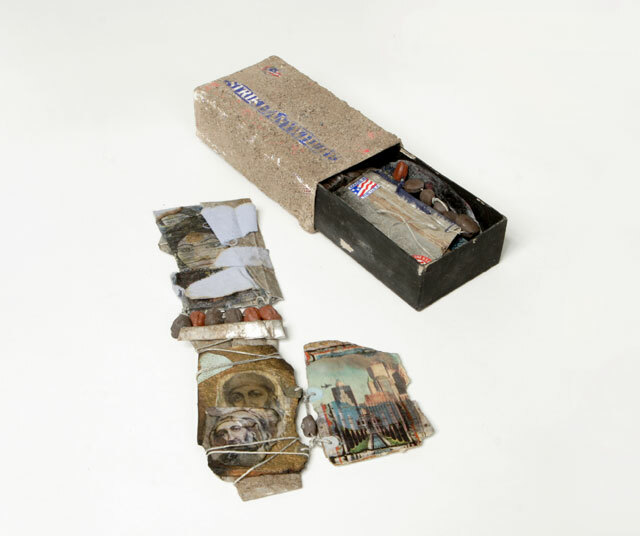 4 3/4" x 2 3/4" x 1 1/2"
A kitchen matchbox covered with ash houses this small two-part book that is a reflection on 9/11 and the war in Afghanistan. Finished before the war in Iraq, one section features an icon-like image of Osama bin Laden surrounded by small clay death heads. Idyllic images from Afghan trucks are superimposed on a photo from the N.Y. Times of the plane aiming for the second tower of the World Trade Center. The second section features a delicate butterfly wing painted red,white, and blue, and a picture of George W. Bush peering like a sheik through the folds of a dollar bill. Collage with detachable accordion book. Wall piece. Stress Tests is a new series that incorporates stories and visual images related to objects that have undergone some trauma. 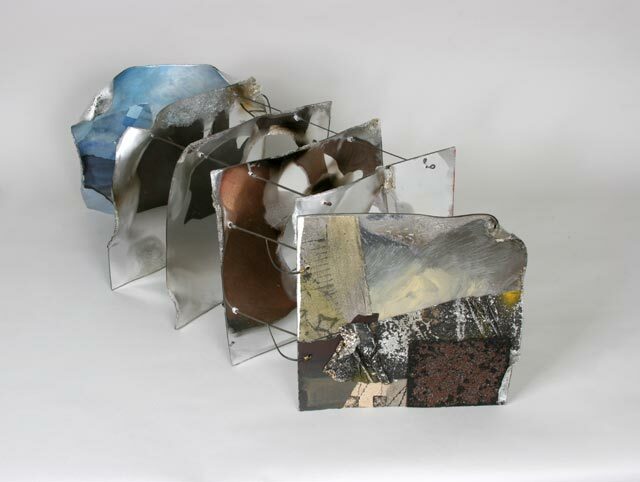 Souvenir, a wall piece with a detachable accordion book, is the first in this series. The narrative depicts the adventures of a deck of cards. 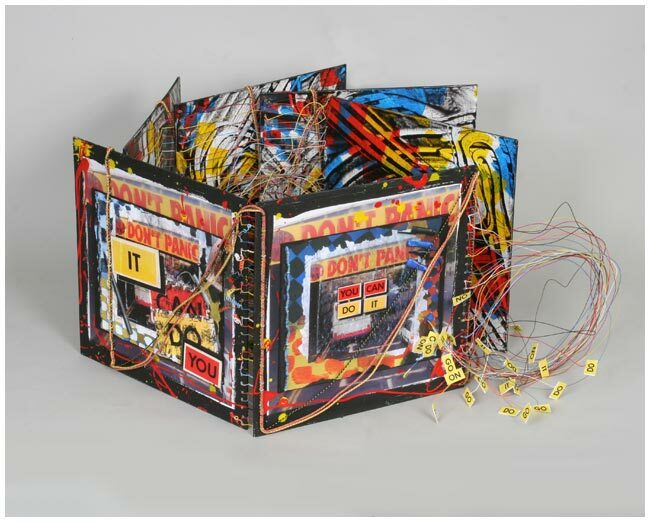 10" x 35" x 1"
Don’t Panic is bound with telephone wire and stands or hangs to reveal a sequence of six directives: YOU, YOU DO IT, CAN IT, CAN IT DO, IT CAN DO YOU, and finally, YOU CAN DO IT. On the backs of the pages are patterns of phrases cut from lists of platitudes given out by well-meaning school officials. They become increasingly more fragmented towards the end of the book. 8" x 4 ½" x 4 ½"
Letters spelling the word “procrastination" made from bookboard backed with doodles and drawings and bound with elastic spaced with wire-covered minute timers. Cover is made from an old alarm clock. A small monument to procrastination, this accordion book is bound with elastic cord. The blank clock face and tethered timers hold the book together and the clock collage has extra hours added to it. The backs of the pages are cartoons and doodles drawn by bored students in the margins of workbooks. Black Arches, book board, Color photocopy, found objects, and handpainted and found papers Unique, free-standing This is a large-scale book that folds out into a maze-like house. Every interior surface is covered with images of cluttered rooms, closets, and passageways. 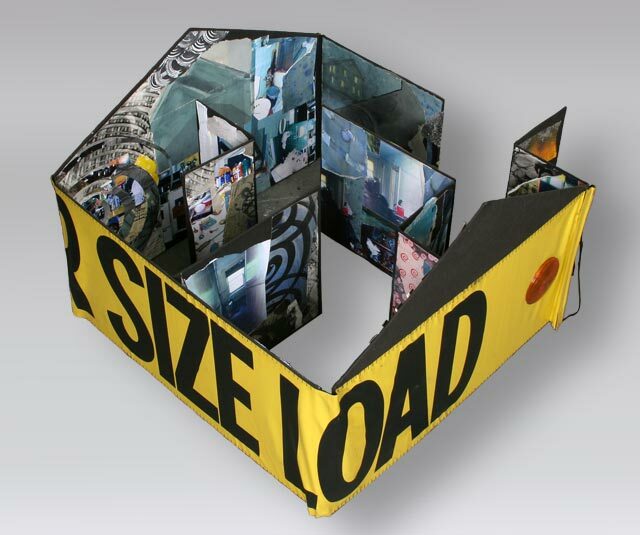 Stitched around the outside and forming the binding of the book is a banner with the words "oversize load" used to flag trucks with wide cargo. Work in progress. Each of the “steps" in this series of wall pieces--there will eventually be twelve--represents an antidote for depression. Just as embossing creates both high and low areas, there is no relief without depression and no depression without relief. The footprint in “Afloat" is depressed through linoleum flooring buoyed by wine corks. The verso of “Down at the Heels" shows worn heels and shoe prints: the rosy front side shows dollar bills and a worn sole. Other “steps" include: “Uppers and Downers" (about the chemical relief of depression), “Home Improvement" (the suburban cure), “Watch the Donut not the Hole" (about food and femininity), and “Muy Trabajadora" (about work). 4 1/2" x 4 1/2" x 2"
This prickly book has the three dimensional feel of a tunnel book. 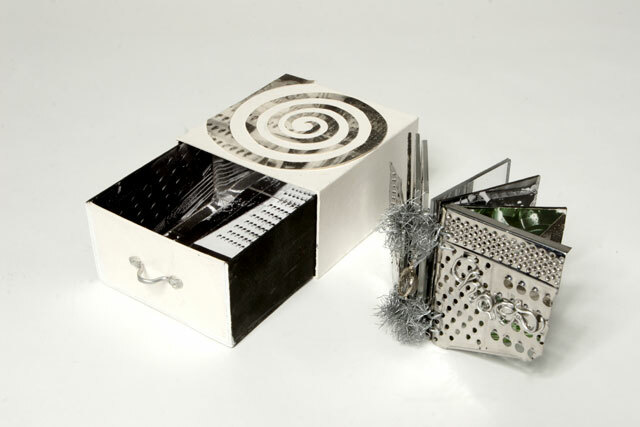 The cover is made of a kitchen grater, and it is bound with unravelled picture wire. The jumble of kitchen utensils is a metaphor for a disorganized and fast-paced life. The effect of chaos is heightened by the use of mirrors which add a dimension of depth to the photographs. 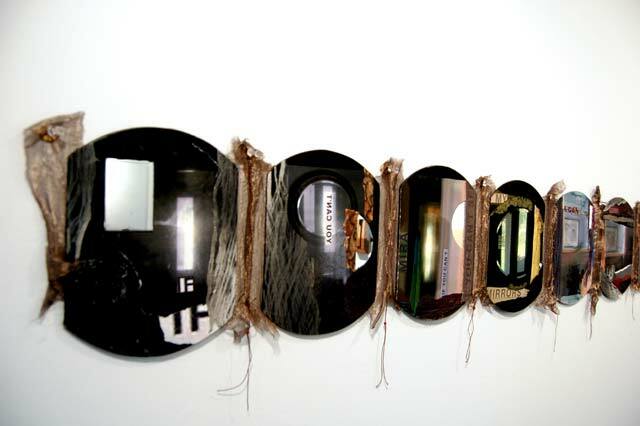 Each page spells a letter of the word “chaos", and the viewer must use the mirrors to complete these letters. The book is housed in a box in the shape of a kitchen drawer. Xeroxes from original photographs; prints, rubbings, drawings, and found objects. 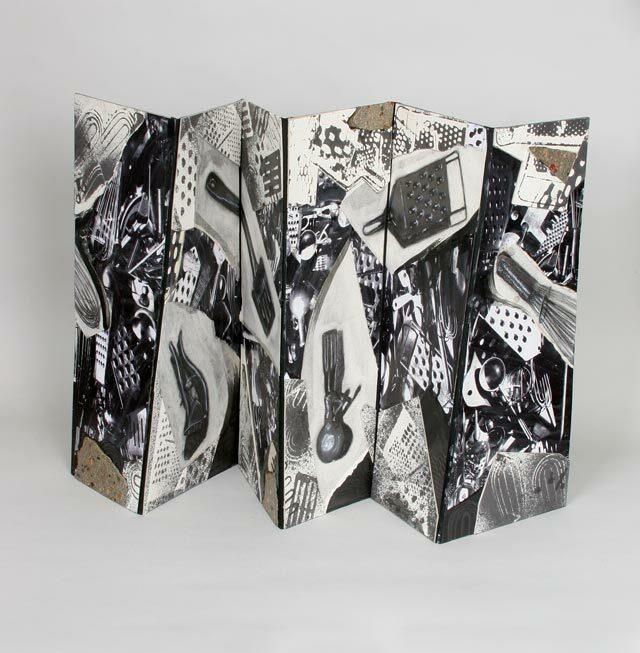 This large-scale accordion book uses multi-layered images of kitchen utensils to take the viewer through the existential exercise of searching for one elusive utensil in a cluttered drawer. The chaotic feeling of the work is heightened by the askew tilt of the trapezoidal pages. 12" x 12" x 40"
Acrylic mirror tiles, wire, acrylic paint. 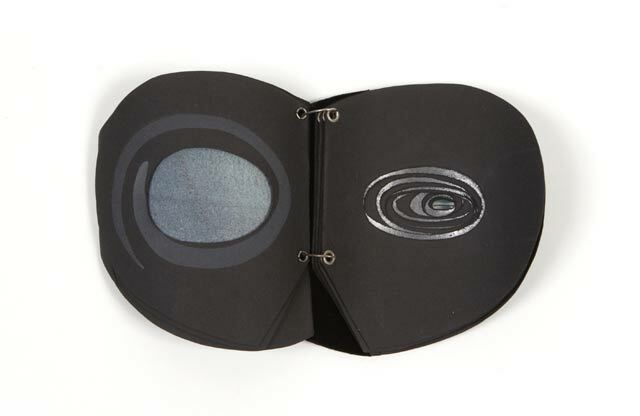 This tunnel book has irregular openings that allow the viewer to see his or her reflection framed by the metallic painting on the backs of the tiles. Because the tiles have been heated, the images are distorted and the reflection at the end of the tunnel is tiny. 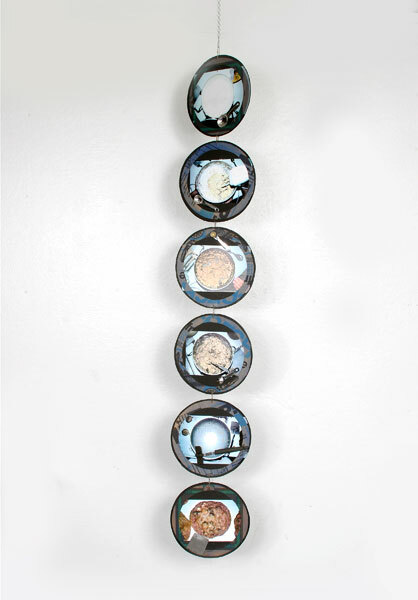 Found objects, collages, beaten copper, hung from vine. Nine collages hang from a twisted vine entwined with hearts of all types and sizes. Most of the collages incorporate a bit of text, and explore an aspect of love. Color copy from slides, shopping bags, found objects, papier d’Arches on book board with wax. Bound with key chain. Boxed in a cake tin with book-board cover. The process of cookie making. An exploration of the motion of stirring and the stirred emotions cookies evoke. Color copy stuffed with laundry lint bound on a metal ring with a chocolate chip made from polymer clay. Color copies from slides of homemade cookies and collages composed of commercial cookie boxes, school hand outs, and articles about mothering. The text on the cookies reads: “Ceci n’est pas un petit gâteau; c’est l’amour. Ceci n’est pas l’amour; c’est un petit gâteau." 18" x 13" x 7"
This stack book explores air. This stack book explores earth. Wall scraps, color copy, found objects, pastel. This stack book explores fire. 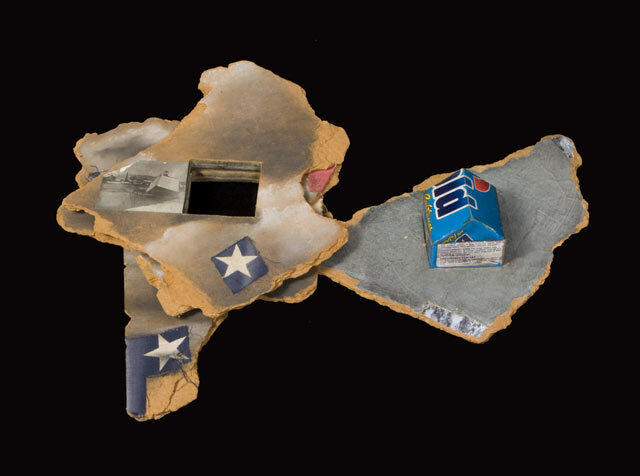 24" x 18" x 4"
Wall scraps, color copy, found objects, graphite, wax. One of four stack books exploring the elements. The pages of this book, resembling ice floes, stack around a small house made of detergent boxes. Reverse sides of pages incorporate old photographs and drawings relating to water and ice. Wall scraps, laundry lint, color copy, bound with fabric and thumb tacks. MUST (Mothers Under STress) incorporates cutouts from a newspaper article on motherhood, “cookies" made of laundry lint. Pages are stacked and bound in a house shape. Box is covered with laundry lint. 6" x 5" x 1½"
Papier d’Arches, color copy from Polaroids, found objects. 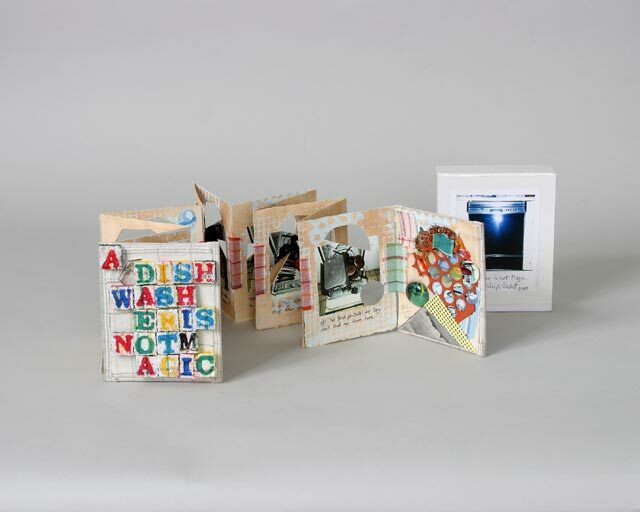 Accordion book with cutouts and portraits of full dishwasher loads. Text from a dishwasher repairman. 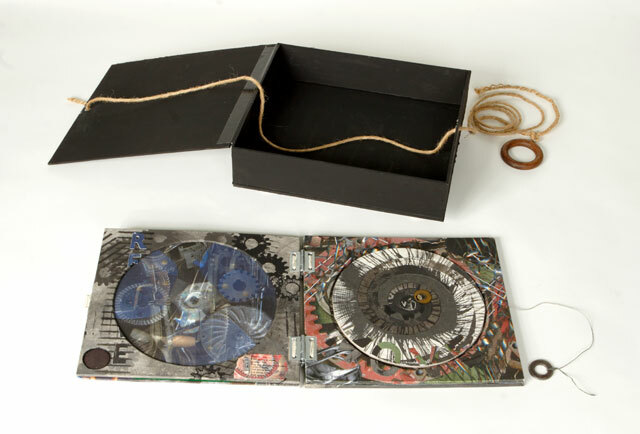 Endpapers encrusted with dishwasher related objects and imagery. Back cover has a design of scrubbers. Box opens like a dishwasher. 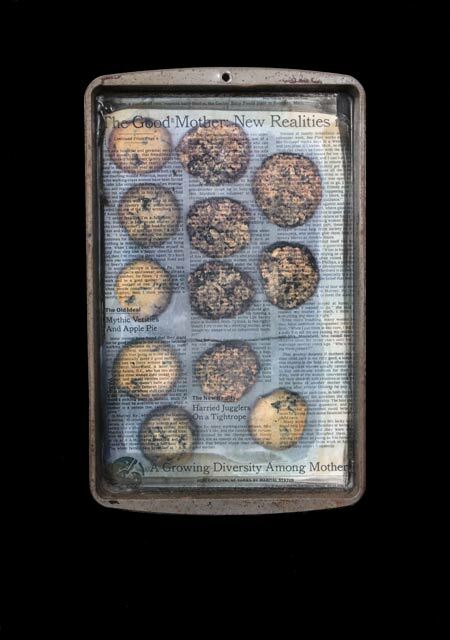 19" x 11.75" x 1"
Photocopy of chocolate chip cookies superimposed on an article from the New York Times about mothering in the 1990s and set into a cookie sheet. 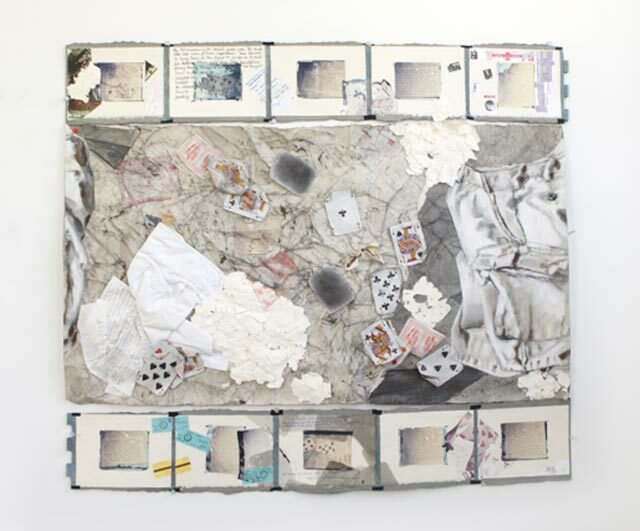 Three warped linoleum tiles with sardine cans embedded in them, covered with objects, fabrics, and juxtapositions that allude to the intimacy, comfort, and slightly suffocating quality of coupledom. Papier d’Arches, found papers, laundry lint, rags, encaustic. 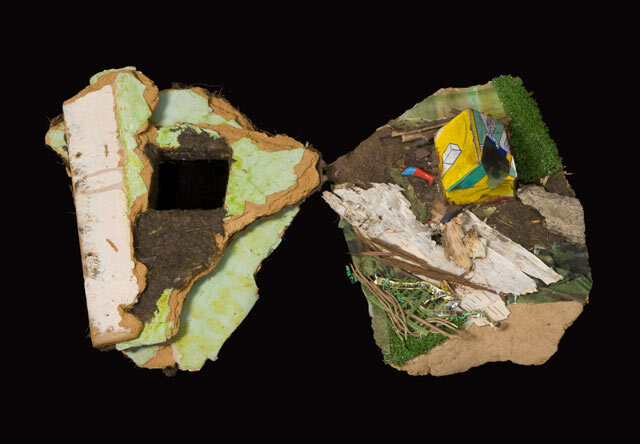 A series of six collages, each with a central landscape, composed of household detritus. 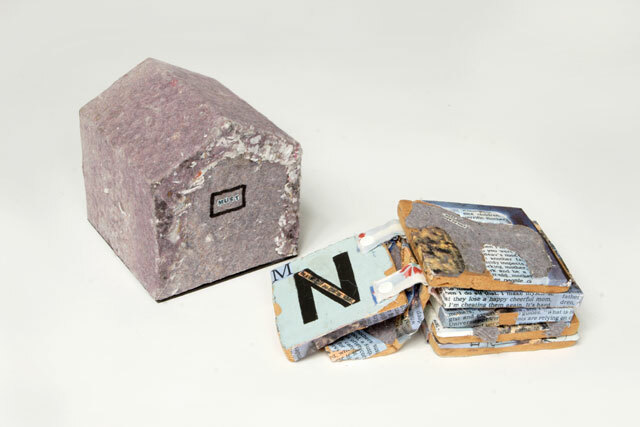 17" x 15" x 2½"
Roofing tile, tarpaper, photocopy, hand-printed papers, found objects, folio-style binding. 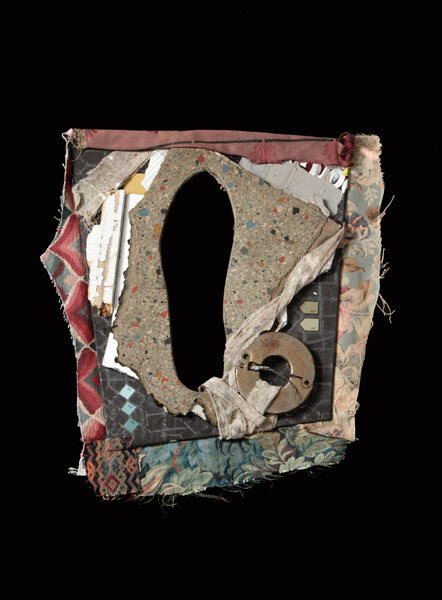 Three collages made of objects embedded in folded tarpaper fit onto protrusions in the cover. Remove Before is about all those things which must be removed before doing something else. 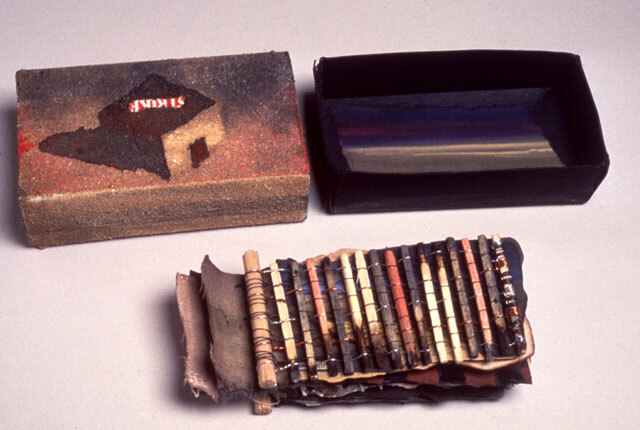 4¾" x 2¾" x 1½"
Sandpaper, paint, found objects, bound with wire woven through cloth and around burnt matches. A kitchen matchbox covered with sand houses this small journal done during the Gulf War. Each page is a collage of a different aspect of the war as it unfolded. The text consists of headings cut from a magazine article. 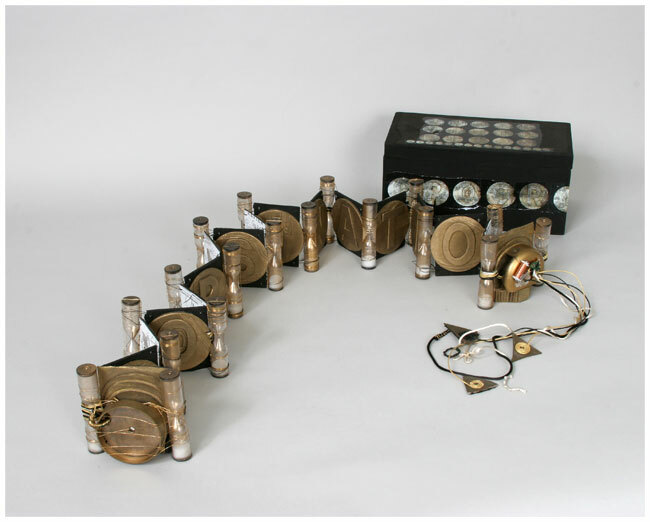 Black papier d’Arches, found objects, steel disks, bound with a nut and bolt, housed in a tuna can. 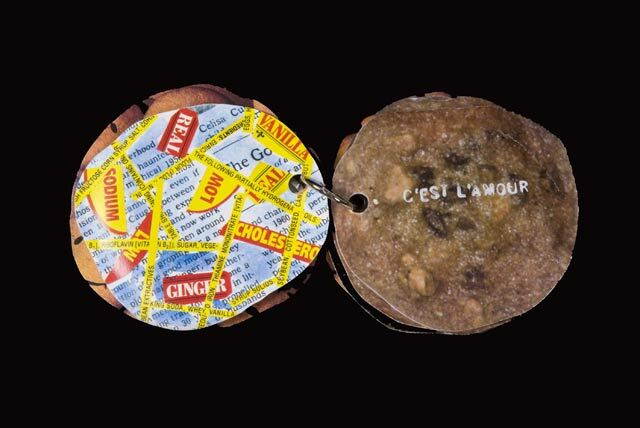 Five circular collages of small found objects set in paper. 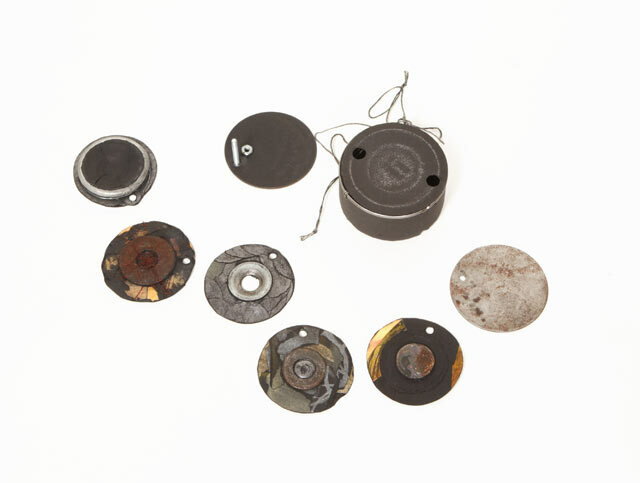 Paper covered steel disks form the cover. 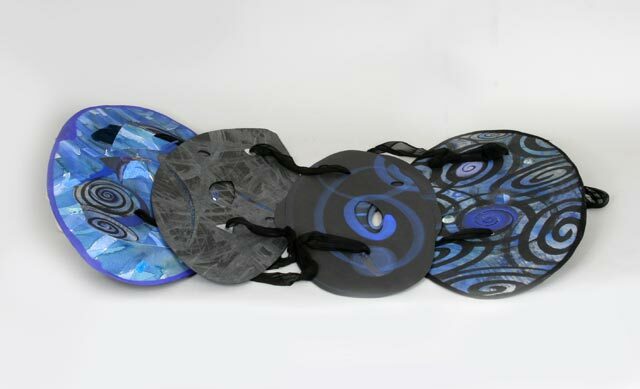 Can be unbolted and displayed flat or wall mounted. 25½" x 10 x ½"
Black papier d’Arches, acrylic, gouaches, found objects. 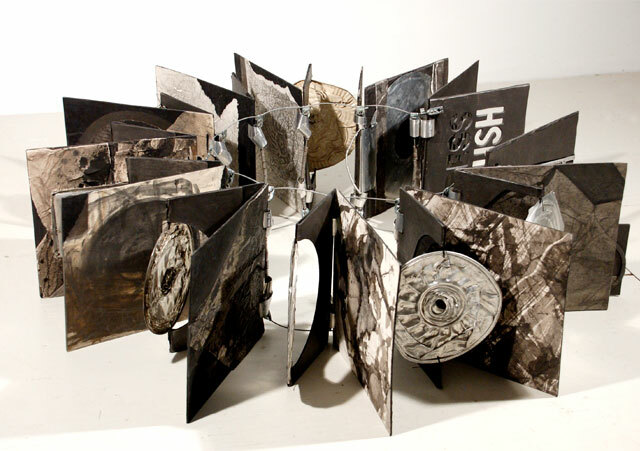 Fan-shaped accordion book. Explores the color yellow through heat imagery. Objects in the last fold are visible through cut out openings when book is closed. May be displayed semi-folded or flat. Can be wall mounted. 29½" x 14½" x 1½"
Black papier d’arches with gouaches and acrylic, papier collé and found objects. Bound with chiffon string through holes in center. Large papier collé endpapers sandwich irregularly shaped pages painted with spirals. Exploration of the color blue; space imagery. Circular patterns in metallic paint on left hand pages. Extra long chiffon allows book to be spread out so all pages are visible. 17" x 14" x 2"
Black papier d’Arches with gouaches and acrylic, papier collé and found objects. Bound with handwoven cord and wood. Papier collé endpapers revealed through openings cut in pages of double thickness and pressed into wave shapes. Exploration of the color green with water imagery. Papers painted with metallic water patterns on each left-hand page. Black papier d’Arches, velvet, graphite, watercolor, and gouache, bound with bent paper clips on a stationary backing. Pages of double thickness curved to conform to the palm of the hand, with openings narrowing to a tiny feather embedded in the last page. This is one of several curved Black Books. 14" x 8 1/2" x 2"
Collages made from fan-shaped pieces of paper folded and worked on both sides. Objects sandwiched between the layers and rubbed with graphite suggest fragments of metal embedded in pavement.